Sharjah: Sharjah is gearing up to take live entertainment to new heights with a new and original theatre production titled ‘1001 Nights: The Last Chapter’, which will be the largest the world has seen. The show is poised to be the grand opening act for the official inauguration of the World Book Capital 2019 celebrations, on April 23, which will pave the way for a yearlong celebration of the prestigious Unesco title Sharjah won last year in recognition of its cultural achievements. The special Al Majaz Amphitheatre production has been developed by world-renowned creators of immersive experiences, Multiple International, and is inspired by the Arab world’s anthology of folk tales One Thousand and One Nights. A unique alliance of 537 theatre artists and acrobats, innovators, technologists and storytellers representing as many as 25 nationalities are shaping this massive production — a Sharjah original that will capture the imagination of children and adults alike, in five daily shows until April 27. Audiences will be able to enjoy the live show in three languages, Arabic, English and French, at the same time. 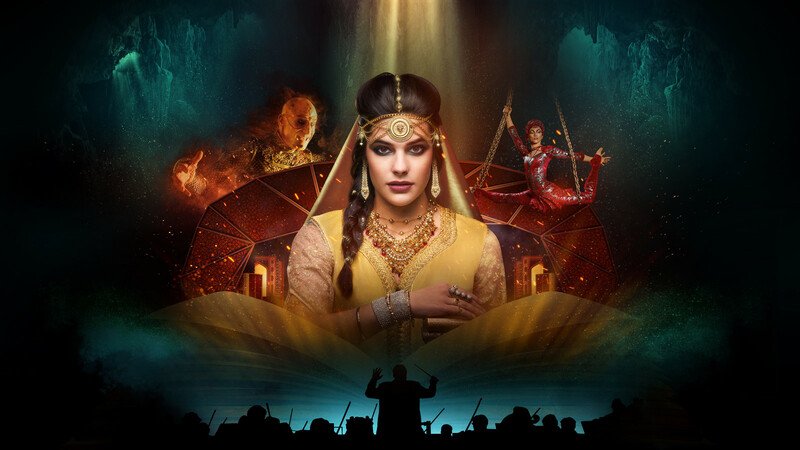 A 51-piece live orchestra will offer the musical backdrop for the show in which a stellar cast of international actors, gymnasts and acrobats treat the audience to 13 different types of performance arts. Preparations for this one-of-a-kind production started nearly a year ago. More than 500 hours of training have already gone into giving the Arabian Nights a fresh interpretation, and a new beginning. 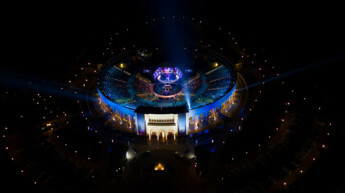 The artists will be dressed in costumes from various cultures while performing and dancing, acrobatic moves and horseback riding, accompanied by a majestic musical performances specially composed for the show, and conducted by an orchestra compromised of 51 musicians from Armenia, Syria, Iraq and Lebanon. A number of artists from Mexico, UK, Brazil, Belarus, Slovenia, Japan, US and Canada will be featuring in the production. The production crew is flying in from Canada and France to oversee the technical and production aspects, while the live music for the show will be performed by a band that has brought together composers, singers and instrumentalists from Czech Republic, the Netherlands, Serbia, Algeria, Canada, Lebanon, Armenia and the UK. Shaikh Sultan Bin Ahmad Al Qasimi, Head of the Inauguration Ceremony Committee of the Sharjah World Book Capital, said: “1001 Nights: The Last Chapter is set to change the face of live entertainment in the UAE, and will reinvent the genre of performing arts. The show is the first-of-its-kind in its unique integration of concept, forms of performance arts — this production will see the kind of audio-visual technology only seen in a handful of theatre productions yet globally, and finally, the number of individuals who have to come together to bring to life this theatrical masterpiece. The show that marks a new telling of a universally popular old tale will come alive on a 1,030-sqm stage. Audiences can expect to see world-class performers bring this enigma to life with masterful acting and extraordinary acts including duo straps, aerial chains, tumbling, dancing, even horse-riding, and of course a live musical orchestra. Sharjah has been crowned World Book Capital for 2019 by Unesco, the United Nations’ cultural body, in recognition of its outstanding role in supporting the publishing industry, and nurturing a culture of reading locally, regionally and internationally.